Exercise Tips for Seniors. These exercises for seniors are easy to follow and fun to do and specifically for those seniors who are mobile. I also offer a series of DVD's with exercises and stretches for those in our age group. Please check the info on the right of this page for further information. For those who are chair bound, please turn to the next page by clicking Chair Exercises where you'll find a program suitable for your needs. Exercise Tips for Seniors: Position for Curl Up 1. This is the starting position for the most important initial exercise in the seniors exercise program. 1. Knees and feet are hip-width apart. 2. This position is called neutral spine which means that all the curves on your spine and in the "neutral" position - your spine is NOT flat on the mat. Exercise Tips for Seniors: Curl Up 2. 1. Take a big breath in. 2. Exhale as you articulate you back off the floor, making sure that you lift one vertebra at a time. This means that you have to "flatten" your back on the floor before lifting up. If you have a ball? Exercise Tips for Seniors: Back Lift 1. Seniors love ball exercise and you'll find a more extensive program on other pages. This is the starting position of an exercise to help strengthen back (and backside) muscles. Make sure your feet are widely spaced with your hands behind your head. An exercise ball is a very useful addition for your seniors exercise program. Check the page for ball exercises before you leave the site. Exercise Tips for Seniors: Back Lift 2. Inhale as you lift, squeezing your buttocks together at the same time. Exhale as you lower back down. For further ball exercises, please visit this link... Stability Ball Exercises. Easy for our older members..
Our STAR SENIOR (below), Gwen, is doing this seniors exercise program with small weights, but it's very beneficial to use them as you gain strength - even a couple of baked beans tins works well! The first seniors exercise in this program, shows Gwen in a neutral standing position, feet parallel and shoulder blades drawn down her back. She is using light weights here, which is optional to start with. Inhale as you lift arms out to each side. Exhale as you slowly lower. 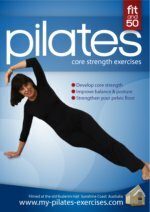 Slowing being the operative word - remember pilates is RESISTANCE exercise. Inhale as you lift arms up above. Exhale as you slowly lower. Again, go slow. Starting with arms beside you in the neutral position again. Then raise them up in front of you, OR out to the side. This exercise requires another neutral position on all fours. This is the starting point for the following 4 seniors exercises. Balance is a problem for many seniors and this first exercise requires balance. You balance will not improve if you don't challenge it so it's imperative you include it in your exercise program. Lift the right leg, then the left knee. Reverse sequence. Straight leg lift. Inhale as you lift each leg, exhale slowly as you lower. If you have lower back problems, do this exercise at your own disgression - lifting leg a small fraction to begin and increasing height as your strengthen. With your leg bent at the knee, inhale as you lift, exhale slowly as you lower. Again, if you have lower back problems, go slowly with this exercise. This time lift your leg inhaling and you do to the side, and exhaling and you lower - just like your dog does when you exercise him in the park! This is a very simple and fun seniors exercise for your program and very effective in strengthening core muscles and toning up around the waist. Sit on the ball with your feet nice and wide and knees bent. Ask someone to stand in front of your with their hands extended towards you, if you feel in need of support. Keeping the upper part of your body still, make lovely large circles with your hips. First up, do 5 one way and 5 the other. Place the ball on a wall at waist height. Stand in front of the ball with your feet a little further forward. With the ball placed comfortable at weight height, Start with 5 squats, wait a couple of days to see how your knees feel. If OK, add more repetitions to your regime. Note: Because the ball is taking some of your weight, this exercises is kinder on your knees. However, you can also do this one in a standing position with someone standing in front of you with their helping hands. If you’re enjoying your ball exercise, there is an extensive program here on this site - check Stability Ball Exercises for a full exercise program - many suitable for seniors.